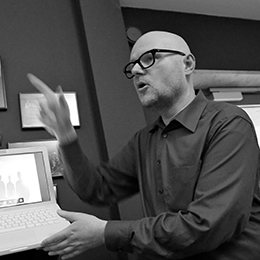 drossmedia.com is the print and UX design portfolio of Michael Drossmann in Wolfsburg, Germany. At this time, there are no internships or job opportunities available. 2016 was the year of hand lettering. 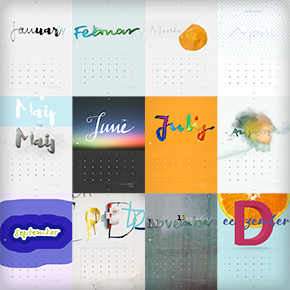 12 calendar sheets came here one by one, featuring my own handwriting powered by a few catchy script fonts. 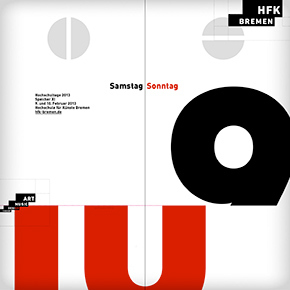 Poster design for the Open Days at HfK Bremen, University of the Arts on February 9th and 10th, 2013. The HfK held a design contest for students and alumni. My entry came up with the idea of a transformed tear-off calendar featuring this important date. © 2019 Michael Drossmann. All Rights Reserved.